A Mercedes Benz F1 racing car became the most-expensive automobile ever sold at public auction while a Ferrari 275 takes the highest price for a road car. 2013 was an excellent year for vintage and classic cars with record prices paid at public auctions. For the second year in a row, a Mercedes Benz topped the list of highest prices paid at auction but most of the top-ten prices were for Ferraris. 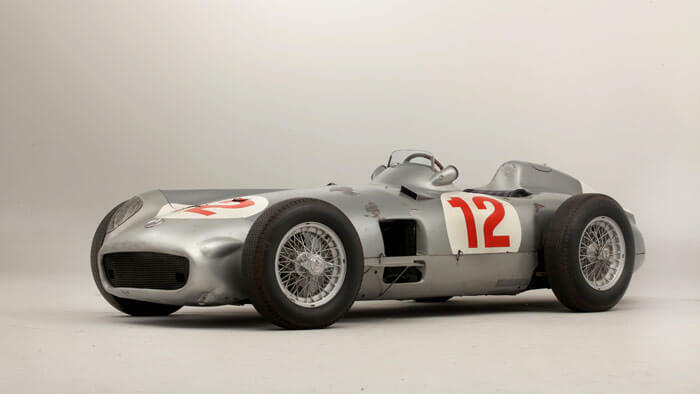 A 1954 Mercedes Benz Formula 1 racing car achieved $32 million at the Goodwood Festival of Speed sale by Bonhams to become the most expensive car ever sold at public auction. A 1967 Ferrari 275 GTB achieved $27.5 million at RM Auctions’ Monterey sale – the highest price ever paid for a Ferrari and for a road-going car. 2013 was an excellent year for public auctions of classic and vintage cars. 2013 saw the highest prices ever paid for a racing car and a road car, as well as the highest prices ever paid for amongst others an Alfa Romeo, Bugatti, Ferrari, Maserati, Mercedes-Benz, McLaren and Porsche. Gooding & Co sold more than 50 cars at over a $1 million each, including 30 at the Pebble Beach sale alone. RM Auctions achieved the highest price ever paid for a road-going car and a Ferrari, and sold a record 78 individual cars at over $1 million in 2013. RM Auctions’ Monterey sale achieved a record $125 million for a single auction, which included 26 cars over a $1 million each. 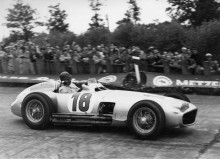 Bonhams sold the 1954 Mercedes Benz F1 car at the record price of £19.6 million at the Goodwood Festival of Speed. Although the Mercedes Benz F1 racer achieved the highest price ever at public auction, a Ferrari 250 GTO was reportedly sold for €38.2 million ($52 million) at a closed auction in Italy in 2013. A similar car reportedly sold for $35 million in 2012 in a private sale. Neither price has been confirmed. The 1954 Mercedes Benz W196R Formula 1 Racing Single-Seater achieved £19,601,500 ($32,301,228) at the Bonhams’ Goodwood Festival of Speed auction in July 2013. This record price was the highest ever paid for a vehicle at a public auction and therefore also the world record for the most-expensive Mercedes Benz and most-expensive racing car ever. This Mercedes Benz W196R was driven by Juan Manual Fangio to his second Formula 1 word championship in 1954. It was the second year in a row that a Mercedes Benz car topped the list of the highest prices paid for a car at public auction. However, last year’s leader – a 1936 Mercedes Benz 540 K Spezial Roadster – sold for $11,8 million. Although only about a third of what the W196R achieved that is still the second highest price paid for a Mercedes Benz road-going car. A 1967 Ferrari 275 GTB/4*S N.A.R.T. Spider by Scaglietti achieved $27.5 million at the record-breaking Monterey sale by RM Auctions. This was the highest price ever paid at public auction for a Ferrari and for a road-going car. The previous record for the most-expensive Ferrari was for a 1957 Ferrari 250 Testa Rossa, which achieved $16.4 million at Gooding’s 2011 Pebble Beach sale. A 1964 Ferrari 250 LM by Carrozzeria Scaglietti sold for $14.3 million (almost half price compared to the 1967 275 GTB) at the RM Auctions and Sotheby’s Art of the Automobile sale in New York. 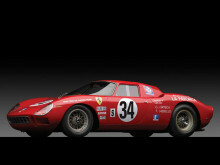 The 1964 Ferrari 250 LM is one of the finest examples of Ferrari’s first mid-engine cars. It was the 24th of 32 models produced. This car won its class in the 1968 24 Hours of Daytona. A 1953 Ferrari 340/375 MM Berlinetta ‘Competizione’ by Pinin Farina achieved the highest price in 2013 for a public auction held in euro. It achieved €9,856,000 ($12,812,800) at the bi-annual Villa Erba auction organized by RM Auctions in Italy. It was also the highest price ever paid for a closed Ferrari Berlinetta. The 1953 Ferrari 340/375 MM Berlinetta was a work’s entry at Le Mans and several further races. It was driven by three world champions: Hawthorn, Ascari, and Farina. A 1935 Alfa Romeo 8C-35 Grand Prix Racing Monoposto achieved £5,937,500 ($9,784,380) at the Bonhams’ Goodwood Revival sale making it the most-expensive Alfa Romeo ever. 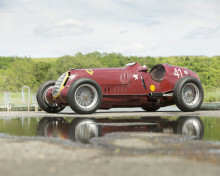 (The previous marque record was £4,245,118 paid for a 1933 Alfa Romeo Monza 2300 in 2010.) The Alfa Romeo was a Ferrari team car and was driven by amongst others Tazio Nuvolari. A 1957 Ferrari 250 GT 14-Louver Berlinetta achieved $9,460,000 at the Pebble Beach sale. This was the highest price ever paid for a Ferrari 250 Tour de France model. It was also the highest price achieved this year by Gooding & Co, which led the listings in both 2012 and 2011. A 1953 Ferrari 375 MM Spider by Pinin Farina achieved $9,075,000 at RM Auctions’ record-breaking Monterey sale. This Ferrari is one of only a dozen 375MM Spiders ever built and belonged to gentleman driver Jim Kimberly. A 1937 Bugatti Type 57SC Atalante achieved $8,745,000 at Gooding’s Pebble Beach auction. This was the highest price ever paid for a Bugatti at public auction. Gooding achieved a further marque record at the Pebble Beach auction when a 1997 McLaren F1 road car sold for $8,470,000. The McLaren was by far the newest of the cars achieving record prices in 2013. The second youngest car achieving more than $4 million at public auction in 2013 (for the three main auction houses) was the record-breaking 1967 Ferrari. 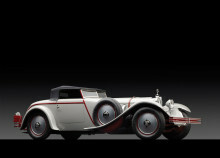 A 1928 Mercedes-Benz 680S Torpedo Roadster by Carrosserie J. Saoutchik was the oldest car on the top-ten list of highest prices paid at auction in 2013. It achieved $8,250,000 at the Monterey sale by RM Auctions. This 680 Torpedo Roadster is one of only three built in this format and the only known survivor. It was the 2012 Pebble Beach Best of Show winner. A 1958 Ferrari 250 GT LWB California Spider similarly achieved $8,250,000 – the tenth highest price paid at public auction for a car in 2013. This was the highest ever paid for the model and was achieved at Gooding’s Scottsdale auction. See also the top prices paid for classic and vintage cars at public auctions in 2012 and 2011.